6 inch Natural Latex Mattress wrapped in pure wool ! Shop bedding at Whitelotushome. Latex mattresses are the natural version of memory foam that’s kinder to the planet, and your health. With a soft plushness that you can sink into, this is a mattress that conforms to your body, while offering lasting support. In sizes from crib to California King — and in custom sizes, too — these all natural latex mattresses offer an organic and hypoallergenic alternative in every size. Where cotton goes to get its degree, GOTS-certified organic cotton is held to the highest standards for health and sustainability. The covers of our latex mattresses are made of 100% pesticide-free organic cotton raised sustainably, from our farms to your bed. Here at White Lotus Home, we hold our shepherds to the highest standards of quality and ethics. Our sheep are raised on rotating pastures to prevent erosion and overgrazing, and their beautiful wool is never treated with chemicals or flame retardants. Wrapped in the finest wool we source, White Lotus Home latex mattresses are naturally antimicrobial and dust mite resistant, and require no flame retardant chemical treatments to be safe. Wool is comfortable in the summer and winter, thanks to its natural insulative properties. Our latex mattress doesn’t have springs, and as such won’t transfer motion between sleepers. We recommend putting it on a box spring set or platform bed, or even using it as a floor bed. A slatted bed frame is recommended for air circulation and the slats should be at least 2.5" wide and no more than 2" apart from each other. When the slats are more than 2" apart, that may affect the longevity and comfort of your mattress. Soft and responsive, our latex mattresses are unlike any you’ve ever slept on, and are the all natural sustainable mattress of your dreams. All of our natural fibers are available for free sampling! Just email or call us at sales@whitelotushome.com or (732) 828-2111, and we’ll get some in the mail to you! As all White Lotus Home products are unique, all dimensions and weights are approximate. A variation of up to 1" in all directions is appropriate. Twin 7" Mattress ∙ 39 x 75 x 7" ∙ 50 lbs. XL Twin 7" Mattress ∙ 39 x 80 x 7" ∙ 60 lbs. Double/Full 7" Mattress ∙ 54 x 75 x 7" ∙ 70 lbs. 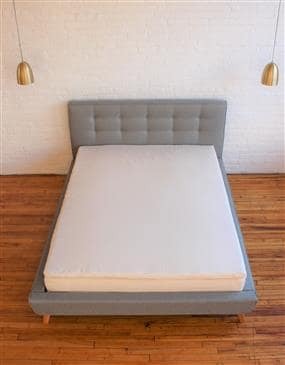 Queen 7" Mattress ∙ 60 x 80 x 7" ∙ 80 lbs. King 7" Mattress ∙ 76 x 80 x 7" ∙ 100 lbs. 72 x 84 x 7" ∙ 100 lbs. I have had this mattress for almost 4 years now and I love it just as much as when I first got it. I love that it has two layers making it easier to manage.. We have small children (accidents have happened on it) but having that top layer is really nice when it comes to cleaning it. I will absolutely buy another one and highly recommend this system. I also felt like the customer service was top notch. I loved getting the mattress in the mail with a big made in usa sticker on it.. I love supporting small business's and the people who work at them! What is the firmness of your Latex? Our natural Dunlop latex is a "Medium" firmness. In Dunlop terms, it's considered a C3 class, which is a rough equivalent of a 32-ILD in Talalay. While initially quite soft and giving, the natural latex offers excellent support and weight redistribution, cradling the body.